We are under way from the Berry Islands to Nassau. We had expected to make this crossing tomorrow, but late this morning we decided conditions were acceptable today, and if we could tolerate the bounce it would give us an extra day of good weather on our way to the Exumas. Wednesday we had a pleasant day at Great Harbour. No cruise ships arrived that day and we had a quiet anchorage all to ourselves. In hindsight, that was our opportunity to drop the tender and explore a little, but we missed it. Winds were beginning to clock around, and by dinnertime a swell had moved into the anchorage and we were rolling a bit. That swell built throughout the evening and into the night, making it difficult to move around the boat or really do much of anything. By Thursday morning it had gotten worse. Two cruise ships arrived, briefly hovered near their anchorages, and continued on their way. I can only imagine how bad it was on the other side of the Cay where they have to anchor, and they won't run tender operations if conditions are rough. Vector at anchor off Cabbage Cay, Little Harbour. It was uncomfortable enough that we decided to move to a different part of the harbor to see if we could get out of it. We weighed anchor and moved as close to the lee of Great Stirrup Cay as our draft would allow. As we were setting the hook, a Krogen 42 came into the harbor and headed straight for us; we recognized the name on AIS, Erben Renewal. We had met them in Charleston at the Megadock, and Lisa on Changing Course had told us to keep an eye out for them in the Berries. They squeaked past us into the channel leading to more protected water, too shallow for Vector. While we had more protection from the wind in our new spot, it turned out that the swell was wrapping around the point and hitting us hard abeam. The rolling was actually worse in the new spot. So after less than an hour we weighed anchor and headed back where we were, this time coming in a bit closer to Goat Cay. We resigned ourselves to a rolly day and mostly stayed seated at our laptops. While it was rolly from swell, the anchorage was otherwise rather calm. Nevertheless we were a little surprised by a knock on the hull mid-day. It was Steve Erben, who was out exploring and stopped by in his tender to chat. We spent a pleasant hour comparing notes before he headed back. He allowed that the spot they were in was somewhat better, and we could probably get in at high tide if we ever needed to. I spent a good part of the afternoon working with T-Mobile to unlock my new phone for use with the BTC SIM, so we can now have full service when we need it. It appears we are consuming our data allotment at a prodigious rate. By dinner time things had improved slightly, and overnight they got considerably better. In the morning the Celebrity Summit arrived to Little Stirrup Cay and dropped their hook, so even on the other side of the Cay things must have been calmer. It was still very windy and even a bit chilly, and their private beach remained nearly empty all day. 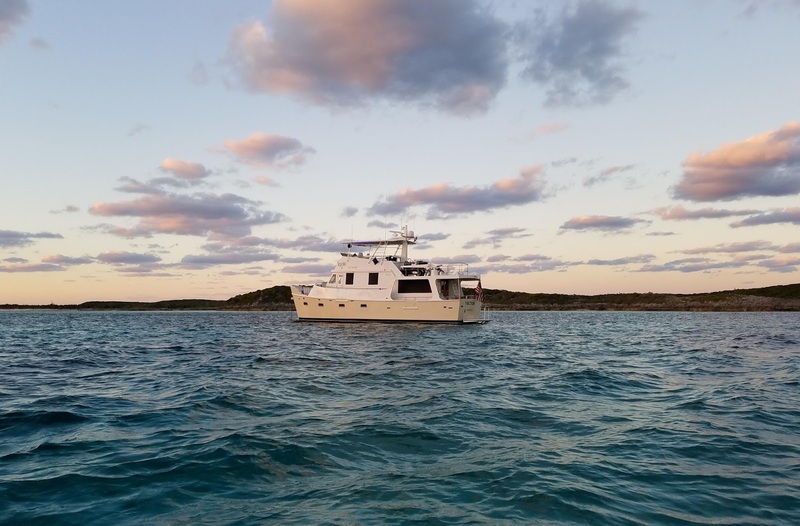 In the morning the Erbens weighed anchor and motored down to Little Harbour Cay. We asked them to report conditions on their way out, and in the early afternoon I got an email saying they had a good cruise in two to three foot following seas. We were eager for a change of scenery and we decided to make the same trip, weighing anchor after lunch for the three hour cruise. 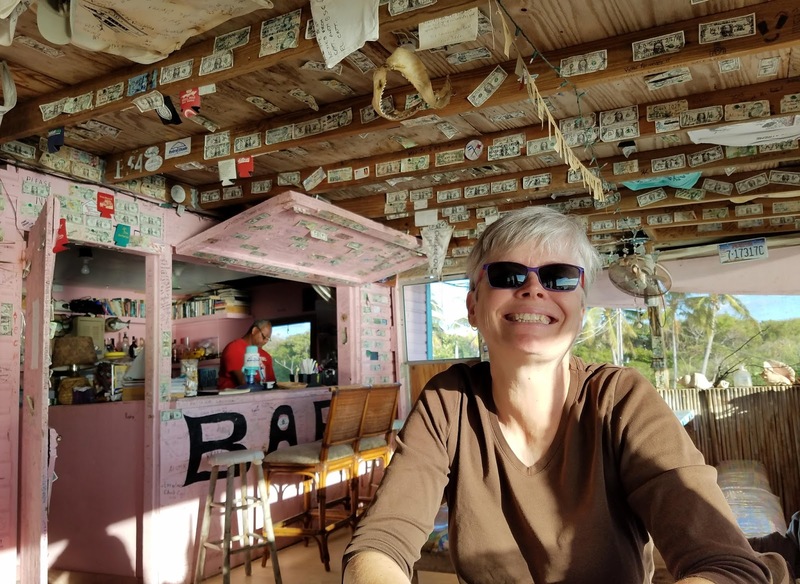 Little Harbour Cay is home to a single family, who operates a small restaurant called Flo's Conch Bar. I you want dinner you need to call ahead on the radio, and as we passed on the outside, we hailed them and made a reservation for 6pm. We pulled into the protected anchorage just behind three sailboats, and had our hook down by 4:30, just south of Cabbage Cay (map). On our way in, the Erbens had emailed to invite us over for cocktails and snacks, so we splashed the tender and stopped by on our way to dinner, spending a pleasant hour with Steve and Julia. Right at 6 we bid farewell and headed up the small channel to Flo's. In short order we found ourselves aground; low tide was at 6:15 and this channel is very, very shallow in spots. We had to back and fill a couple of times and pick our way through, finally arriving at Flo's a bit late for our appointment. Eat at Flo's. That's Chester across the bar. It was good to get off the boat for the first time since the Big Game Club back in Bimini, and chef Chester fixed us a nice meal of fried fish, peas and rice, and a salad, alongside a cold Kalik. 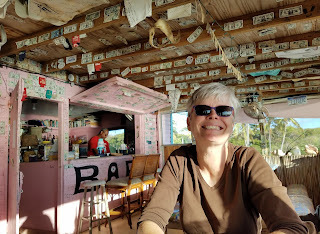 It was just the three of us in the restaurant, which is decorated in dollar bills, logo T-shirts, and logo coozies left by other cruisers. The Cabbage Cay anchorage was much calmer than where we had been in Great Harbour, a welcome respite from the movement. Louise was able to sew and I watched a movie on DirecTV in the evening. The TV is giving me fits, as it now refuses to turn on when commanded. I have to power-cycle it a dozen or more times to get it to come on, with perhaps a five-second delay between attempts. If we get pinned down again I think I am going to open it up and see if I can do anything for it. At this moment we are a little more than halfway to Nassau. We have a beam sea which is making for a rocky ride, but it's tolerable. We just crossed over the deepest part of the voyage, some 10,020' or just under two miles. I can see the high-rise resorts of Nassau ahead of us, some dozen miles distant. We'll anchor in the harbor, and while we had not planned on going ashore, it looks like I need to buy more data for the phone, so we might tender in for dinner. 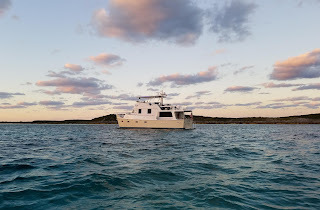 Tomorrow we'll head south across the bank toward Norman's Cay.